THE TACTICALLY DEVASTATING KHALSA. Unable to gain any ground for the 5th day the Indian army launch another main assault from the northern entrance. The Khalsa Fauj from their fortified vantage points cut Indian soldiers down into the night. The Indian forces’ heavy shelling of buildings started on the morning of June 5th. By the evening, the Indian states larger plan was set into motion as various Gurdwaray across Punjab were targeted and simultaneously attacked. As many as 74 Gurdwareh across Moga, Mukhtsar Sahib, Faridkot, Patiala, Ropar and Chowk Mehta were attacked, away from the main battleground of Amritsar. Later that evening, the main assault was initiated. 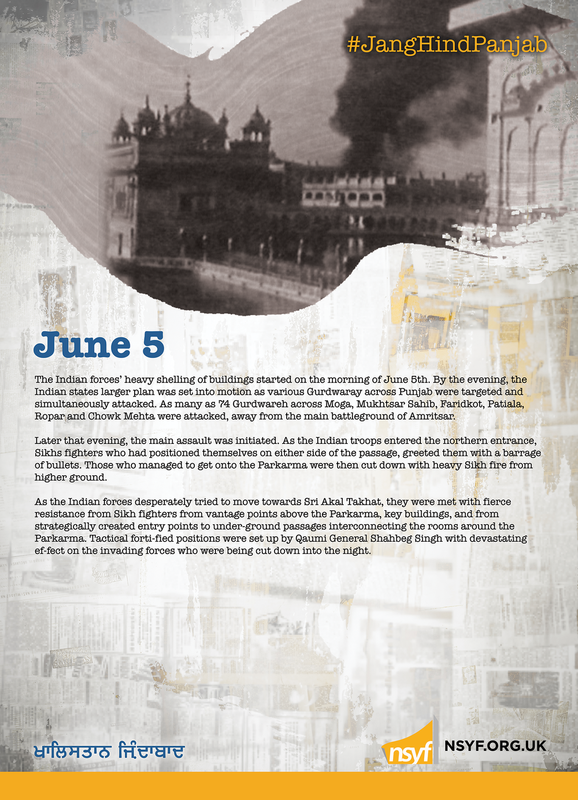 As the Indian troops entered the northern entrance, Sikhs fighters who had positioned themselves on either side of the passage, greeted them with a barrage of bullets. Those who managed to get onto the Parkarma were then cut down with heavy Sikh fire from higher ground. As the Indian forces desperately tried to move towards Sri Akal Takhat, they were met with fierce resistance from Sikh fighters from vantage points above the Parkarma, key buildings, and from strategically created entry points to underground passages interconnecting the rooms around the Parkarma. Tactical fortified positions were set up by Qaumi General Shabeg Singh with devastating effect on the invading forces who were being cut down into the night.